Grab your mate and get your fall on! 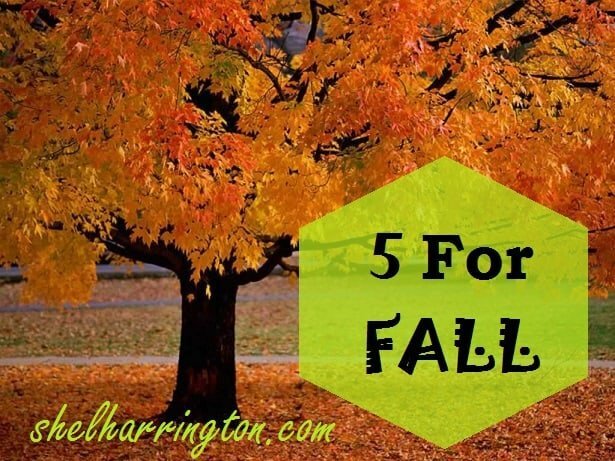 Celebrate the season with one of these five autumn activities – each with its own Plan B. Enjoy a few hours at a cider mill munching on cinnamon-dusted donuts and sipping fresh cider. grocer or fruit stand and try out some of the different varieties to get your apple fix. Fill a bowl to munch by day, and have some caramel Wrapples standing by for a snack to go with your evening movie. Kick up some fall leaves and enjoy the colors. PLAN B: Not in an area flush with maples, oaks or aspen? Check out your local craft store for some faux fall leaves and line your mantel, table tops or shelves to bring that fall feeling indoors. Take a walk and breathe in the fall scents. PLAN B: If the weather isn’t cooperating, recreate those fall fresh scents like autumn leaves, pumpkin spice, maple pecan and mcintosh apples with a little help from Yankee or another candlemaker. PLAN B: Not up for the mess or prefer silly to scary? 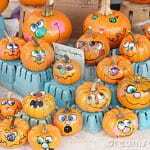 Paint fun faces on pumpkins instead. There’s patterns out there for any level of artistic ability! Sip a pumpkin latte at an outdoor cafe. PLAN B: If coffee house prices don’t fit into the budget this week, take advantage of the seasonal coffee creamers available at your grocer and sip your home-brew on the porch with the one you love! Sweet Plan Bs for those of us in the south! Yates has a second cider mill?? I am sooooooooooo jealous, Diane! Cider and donuts at Yates is one of my favorite memories about growing up in that area. That and the beautiful fall colors on the trees. Which often could be seen around Yates! Have a glass of fresh cider for me, please! Well, gosh-darn Shel – that makes me want to leave my bright spring morning and nip across the equator ….. Except for you can’t do that, Pauline, because you’re busy painting, right? I love fall and my favorite thing to do is layer up and take a long walk with my special person. Fun activities, Shel! 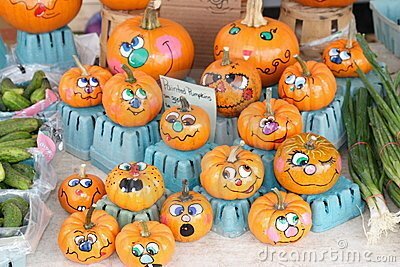 Instead of carving pumpkins, though, I love doing what is already in your examples; we use markers, paints, fake hair, hats, little eye glasses, etc., and adorn entire families of miniature pumpkins. 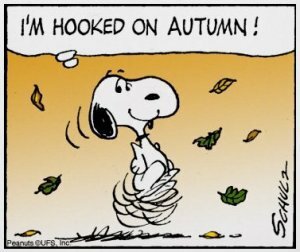 I also love walking in fallen leaves, though I really miss the fall evenings of my youth when our parents let us rake the leaves into piles at the curb and have a carefully supervised burn. The smell was wonderful…and sometimes we even roasted marshmallows, too! I’m loving the pumpkin glasses, and hair, Marylin. Instead of Mr. Potato-Head you had the Pumpkin-Head Family! You brought back memories describing the leaf fires and roasted marshmallows – two of my favorite things. I just saw that Yankee Autumn Leaves scent when I was doing this post. I may have to break down and order me one to satisfy my curiosity. If it’s as close to the real thing as their McIntosh Apple, I might have an addition to my “favorite things” list! Nice ideas, Shel! I’ve had my fall decorations up since September 1st, unfortunately it still feels like summer with temps in the 80s. Happy Weekend! 80s sounds good to me, Jill! We went from that a day or two ago to damp and chilly low 50s day – not a surprising contrast in Oklahoma! On the positive side, it’s the type of day that demands that one curl up with a good book and a cup of hot something for a lengthy read. And who am I to argue with The Day?? We have a touch of Fall in the air in Texas today, but alas, it will be gone by Monday. But…Tuesday we are flying east to Washington, Boston, and then to Bar Harbor, Maine. A cider mug and donuts sound delicious, and, of course, I’m on a lobster, crab, scallop, hunt. And hope for some pretty leaves, if we’re not too late. I am sooooooooooo jealous, DiAne! When my folks lived in Maine I visited every October – between the amazing fall colors and fields filled with hayrolls, I was ‘over the moon!’ We celebrated with seafood no matter what time of year I went up – scallops and king crab tie for first place with lobster and clams close on their shells! Give my regards to ‘Bah Hahbah’ and have a scallop or two for me, please! I love every one of these – and we do them all, too, in some form or a close version of what you have here. 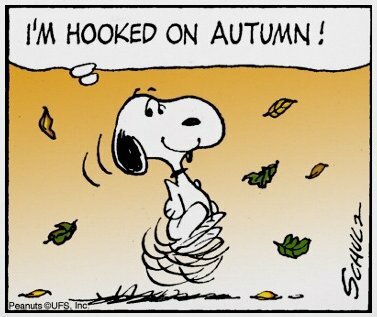 I just love fall – definitely my favorite of all the seasons. I am so glad it’s finally here! I’m with you, Lisa – this is hand’s down my favorite season! And a great time to try your Hearty Lentil Soup recipe!! I sometimes keep my fake fall leaves draped across the mantel past the first snow – it may be winter outside, but it’s still fall in my house! I must admit though, I get a bit homesick this time of year – nothing like sugar maples in the fall! Great ideas. We just went for a walk together earlier tonight. Glad you got it in yesterday instead of today! Although it looks like we’ll be returned to our regularly scheduled fall OK weather in the next day or two!